1894 found the United States in a deep depression. 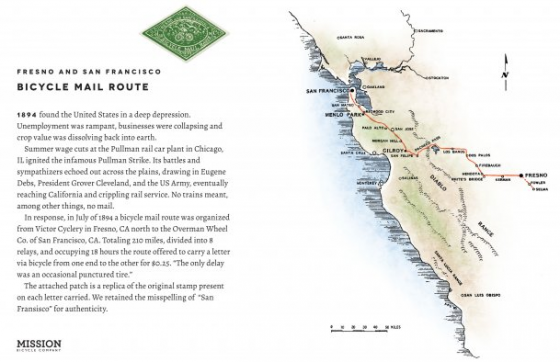 The infamous Pullman Strike crippled rail service west of Detroit all the way to the California coast, isolating San Francisco. No trains meant among other things, no mail. In response, a bicycle mail route was organized totaling 210 miles, divided into 8 relays, and occupying 18 hours. The route offered to carry a letter via bicycle from one end to the other for $0.25. This patch is a replica of the original stamp present on each letter carried. We retained the misspelling of San “Fransisco” for authenticity. 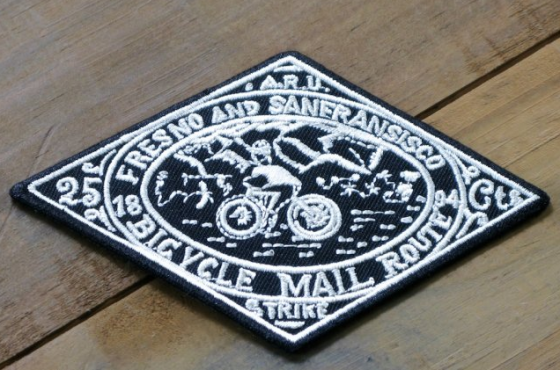 Get your patch at the Mission Bicycle shop on Valencia, or online here. Yeah but did those guys have a warm can of PBR in their bag? “Frisco” would not have been fine.